Today I have a sweet little Unity card to share with you. 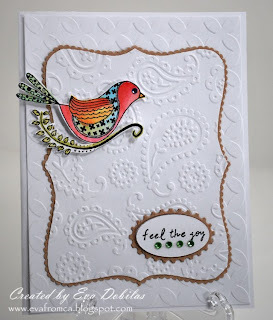 And it's also for one of the challenges at Splitcoaststampers, which is to create a Clean and Simple Card. Well, that sure is challenge for me, as I seem to like to add too many pretty things to my card, so I challenged myself to do this challenge...hehehe. Also this card is representing two other challenges at the Unity Forum....one not to have any type of ribbon on the card and to use an image with wings, so I used the pretty bird image from the July kit. So here is my card.